Cardoon is an old Victorian favourite, once grown as a vegetable and blanched for use rather like celery. Cardoon is now valued for its striking silvery giant thistle like shape which adds a theatrical touch to a border. 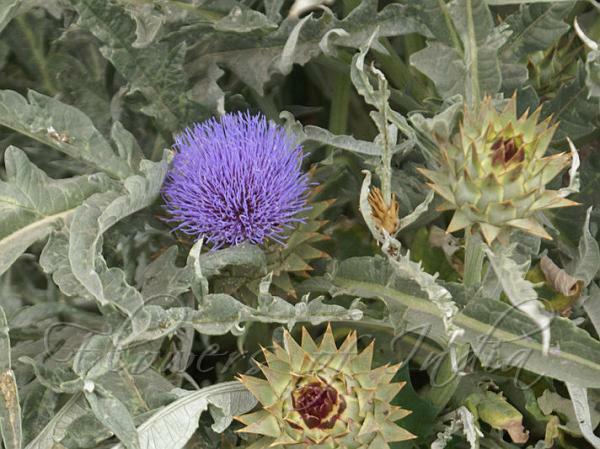 Cardoon is a magnificent perennial native to southern Europe, with spiny, gray-green foliage and purple, thistle-like flowers to five feet. In summer tall flower stems are topped by fat thistle buds which resemble small globe artichokes - the plants are close cousins. The buds finally open into large purple thistles which attract lots of bees; the dead heads often dry quite attractively on the plants. Native around the Mediterranean region, cardoons are thought to be the wild progenitors of the globe artichoke, Cynara scolymus - a plant only known in cultivation. The fleshy leaf bases of the cardoon are sometimes eaten cooked or raw, like celery. Both artichokes and cardoons have specialized bracts (phyllaries) that surround each composite flower head, the inner, soft base of which is edible in the artichoke. 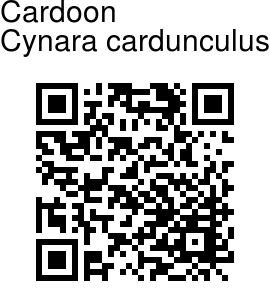 The name Cynara comes from the Greek kyon, a dog, a reference to the tooth-shaped phyllaries.